It's coming to the end of the school holidays now and I'm sure we all have the same 'bored' children by now. It's just too long a holiday and by this time, we've done everything we needed to do and seen everything we wanted to see. So it's up to the board games to take the boredom away, and lately there have been some amazing games that keep kids playing for longer and having fun. And today, I have a new giveaway for one person to win a duo of games from University Games. First up is Googly Eyes - This is an hilarious drawing game that challenges your vision as you put on the vision-altering google eye glasses and start to draw while your team tries to guess what you’re drawing. 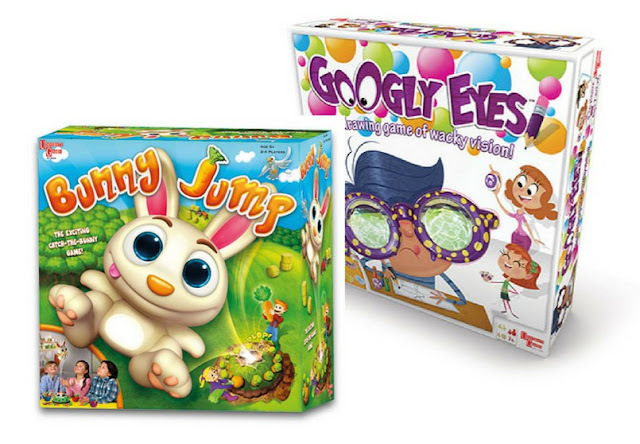 A fun game that lets players of different ages and skill levels compete on equal terms, since the goggles make it fun and challenging for everyone. 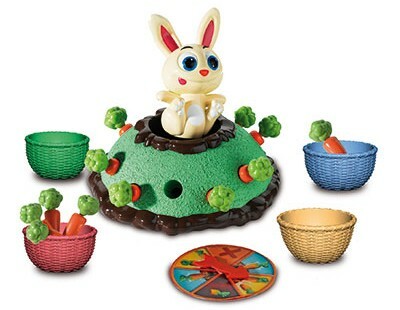 And secondly, Bunny Jump - This bunny is safely sitting on top of his burrow watching his carrot field. You simply have to pull out the carrots, but be careful not to frighten him! Stay focused and be ready to catch him when he jumps in the air! Be the player who’s collected the most carrots when the game ends. my eldest son has always been a bad loser, if anyone else wins they were cheating! My youngest son - he goes in a strop if he loses! My niece, she is such a cheater!! Hubby is also a very bad loser! My teen as they do a kevin and perry if they are the loser. my cousin, who hates losing. My grandson Alexander, throws a wobbler when de does not win! It would be me, I'm really competitive! my daughter, she storms off if she loses! Just comment who is the worst board game player in your house . . . . my grandson . . . such a sore loser, he is so competitive. Me,I get bored too easily with board games. My son, he is such a sore loser! That would be my great-nephew Maxx who is known to throw a tantrum, and sometimes the board, if he's losing. We usually end up starting the game again. My youngest son, he’s a terrible loser! I'm afraid it's me - terrible loser. I was always the loser as a child. It put me off playing games for years but I am now enjoying playing the excellent range of games with the children. Definitely my boyfriend! He is so competitive and such a sore loser! My Brother, he makes us play so he can win! My youngest son is a terrible loser, my eldest son takes games a little too far, he is far too competitive!! Would have to be my mum I think! My nephew, he's six and flips the board of he doesn't win. My daughter Penny, everything in her life is not fair! My husband is because he does not pay attention! My youngest. She hates losing too, so will sulk! My eldest son seems to have no luck with games!! My son Samuel - he hates losing too. Man of the house :- Competitive, so not happy unless winning. My boyfriend, he is so competitive and hates losing! Probably me! I'm not the best loser, sometimes! My husband as he likes to win! my partner... he never even tries to win!! my brother - bad loser! My husband for sure, he is way too competitive! My mam always tries to get away with cheating sneakily lol! My son Monkey is the worst player he will follow the rules until he starts to lose then he becomes a little cheat and when he starts to win will leave the game and proclaim to be the winner! My husband. Whatever we play he takes it so seriously. My youngest Granson Harley aged 5. He hates losing and makes a big thing of it. My daughter likes playing - but only if she wins. I'm the worst player in our house has to be me, I loose at most games. Probably me - I hate losing! My six year old at the moment, such a bad loser even when hes winning! My partner is the sore loser in our house hates it if his 6 year old daughter beats him lol!! My son, he gets so angry if he loses! Probably my 8 year old, as she hates losing. It would be my third son - he is so bad at taking turns! We all get out of sync! My daughter is a sore loser! Definitely my son, such a bad loser...we've always hoped he'd grow out of it but at 16 still pretty much the same! My daughter, she always cheating, and she is very upset when she loose. My fiance Steven, he is great when he is winning but he is such a sore loser and accuses everyone of cheating if he is not winning! my 5 year old Isla has an absolute meltdown when she loses! it doesnt help that my hubby really winds her up every time she loses though! Our 8 year old son, he gets the right hump if he doesnt win! My 8 year old son. My little boy hates losing, plus when my dad visits, he cheats. My duaghter - she hates it when it's someone elses go! My Daughter hates losing, she'll try and make up a new, last minute rule! Both my sons are bad losers, but we all still love playing games. My husband - far too competitive! When my son was young he used to tip over the board if he was losing. my hubby, he's so competitive and throws a right strop when he's losing. Earthquake during monopoly anyone? My sister is a bad one for losing so will cheat any chance she gets. My 6 year old son, he can be a sore loser and sometimes cheats.